Add intense moisture while gently sloughing off dead skin to reveal healthy-looking skin. 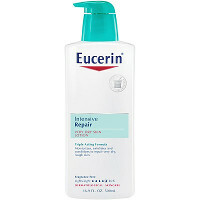 Dry Skin Therapy Plus Intensive Repair Enriched Lotion by Eucerin combines natural skin moisturizers with alpha hydroxy to add softness and smoothness to rough skin. Non-greasy formula will not clog pores and absorbs quickly into skin.